Within a few minutes our lives are can be changed forever. Thrown into turmoil. Turned upside down in the blink of an eye. Clouds rush in from out of nowhere. Winds quickly pick up to a terrifying speed. Torrential rain whips down and rapidly causes flash floods. We never know what Mother Nature is going to send our way. You can’t stop a massive storm from hammering down your door, but you can be prepared. When the crisis hits – demand for food will soar. Supermarkets and corner stores will be rushed with hungry shoppers desperate to get their hands on lifesaving foods to feed their families. It doesn’t even have to be a storm. It could be an economic collapse or civil unrest…an attack on our country’s soil. When a catastrophe hits your home you have very little time to react. It becomes somewhat of a do or die scenario. Every family in America and around the world should be prepared for this. I sure hope so. There is a common myth that in order to be prepared you need to have hundreds of dollars lying around in order to buy food. The trick, especially if you’re new to prepping, is to start small. Start with what you can afford and slowly build your stockpile from there. 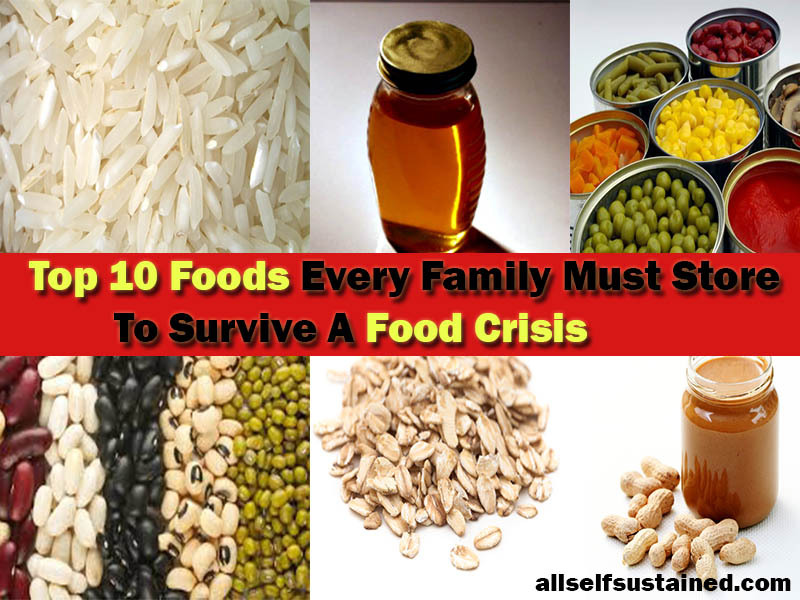 The point of this article is to help you understand the top 10 food you should be storing in the event of a food crisis. First though, if the S well and truly does HTF the first 2 on this list will be your staple. They are packed with enough carbs and protein to keep you and your family going. They may not taste that great – and are a little bland and boring, but hey – we’re talking survival here! Cheap, lasts a long time and is easy to store. It is packed with carbohydrates which are essential to your survival. 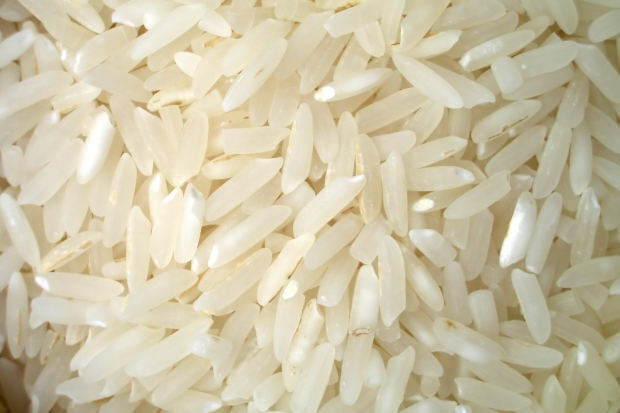 When stored correctly rice can last for up to 10 years. High in fiber, protein and antioxidants. They are not only as close to perfect a survival food they also may aid in disease prevention too. Beans cheap too. Be sure to store them in a cool, dark place and they can last up to 10 years. Like I said – close to perfect survival food! Easy to store, high in fiber, cheap and has very good health benefits. Oats are an excellent food to store, especially if you have kids. There are lots of delicious things you can do with oats (nice break for the kids from rice and beans!) Oats have also been proven to lower cholesterol. It’s delicious! That’s it! Just kidding…not only is peanut butter delicious every spoonful is packed with protein, vitamin E and cholesterol-regulating monounsaturated fats. Packed with carbs, fiber and iron. Once again, relatively cheap and easy to store. Lasts for up to 2 years (can last longer). It’s better than regular flours because it contains oils that helps it last longer in storage. Honey is packed with sugar and energy which are greatly needed in a survival situation. I prefer to store honey over sugar as it can pretty much last forever when stored. If honey is a little out of your budget then substituting white and brown is a good fix. Lasts forever and performs multiple tasks. Other than the obvious – adding much needed flavor to your food (imagine a diet of rice and beans with no salt…) salt can be used for curing and drying meat too. Vitamins of course! Vitamins are essential to your health and well being. In a world where the S has HTF you will need to be on your toes…which means being as healthy as possible. Not only do fruit and vegetables help fight off disease – they are also delicious. The are not, however, the most practical food to store. They take up space, are relatively expensive and can go bad. The good news is that if you’re in it for the long run (society completely collapses) you’ll be able to grow these. Good storable food packed with carbs. Pasta is one of those great foods that are easy to cook and last a long time when stored. Pasta is also quite inexpensive. 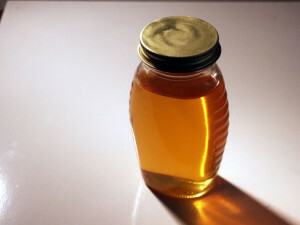 Honey will last nearly forever when stored correctly. Think about your family members. How many of you are there? What will you need to survive for an extended period of time? Does anyone in your immediate family suffer from any food allergies? Ask yourself those types of questions. Tip: An easy way to prep. Start slow but be consistent. What I mean is – say you’re going to the store to buy some rice. Instead of buying one – bag buy two. You can then use one for your current day to day cooking and store the other one. You’re already starting to build a stock pile of food without really doing anything! Whatever you do please remember to keep an inventory of what you’re storing. You’ll then know how much you have and how long it will last you for! Keep a look out for coupons. Every day I look out for coupons to buy food with. I would estimate that I save hundreds, if not thousands of dollars a year on food doing this. I really hope that’s a help for you. If you have any questions or comments I’d love to hear from you below!